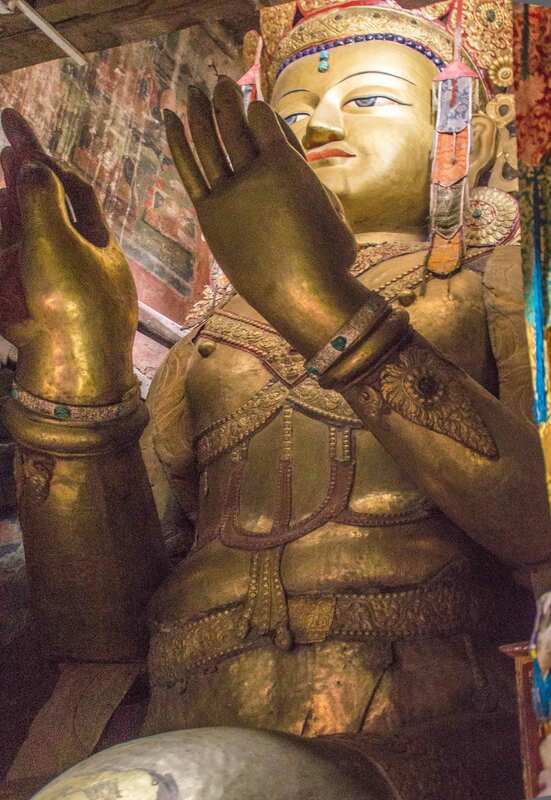 The gilded copper-clad (gser zangs/Serzang) statue of Maitreya is seated at one end of the Lhakhang with the feet almost touching the base of the pillars (Fig. 1). The statue rises into the lantern constructed of wood. The glass window allows some light into the chamber and importantly provides access for the Maitreya to gaze over the village. The seated figure is approximately 6m high, and though it is often referred to as the tallest sculpture, the Maitreya sculpture in the upper Lhakhang is taller by several meters (Fig. 2). The quality of metal work is very good. The sheets of beaten copper follow the complex contours of the figure, mimicking the skin. The jewellery is in repoussé work encrusted with semi-precious stones. 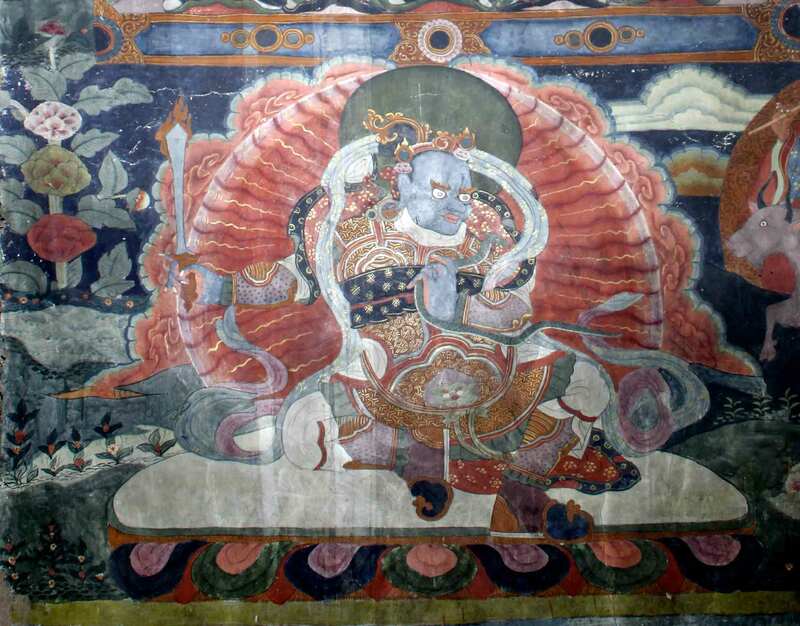 The Lhakhang is richly decorated with paintings following the Drukpa Kagyupa lineage, with an emphasis on deities who ensure good health and well-being. The iconographic program follows canonical norms, with the images of the main figures displaying a high degree of precision and concurrence to the prescribed iconometry. The placement of the figures on the north and south walls is integrated, due to the absence of visual devices such as attendant figures and associates surrounding the deities. The horizontal space on each wall is emphasised by borders—on the top is the traditional motif of fabric pattern and on the lower side is a plain broad band (Fig. 3). The horizontal space is divided into eight sections, with one major figure seated on a throne, and three associated figures placed at the top, in small roundels. On the north wall is the composition of the Eight Medicine Buddhas; and on the south are the eight Bodhisattvas. This iconographic program in the Lhakhang favours a pantheon that would ensure good health and a long life. This suggests that the Lhakhang reflected the concerns and aspirations of the individual patron—the king, and the royal family. West Wall (Fig. 4): On the right wall (facing the west wall), of the seated Maitreya, is Vajrasatva seated on a lotus throne holding flower stems, in what appear like folded hands (the mudra is not very clear—it would appear that the dharmachakrapravartan [setting the wheels of the dharma in motion] mudra is implied). The flowers on both sides have a Vajra (thundervolt) and Ghanta (bell). The other figure is that of a lineage guru Jamgon Mipham Gyatso in the dharmachakrapravartan mudra. Both figures are surrounded by the Kagyu lineage gurus. 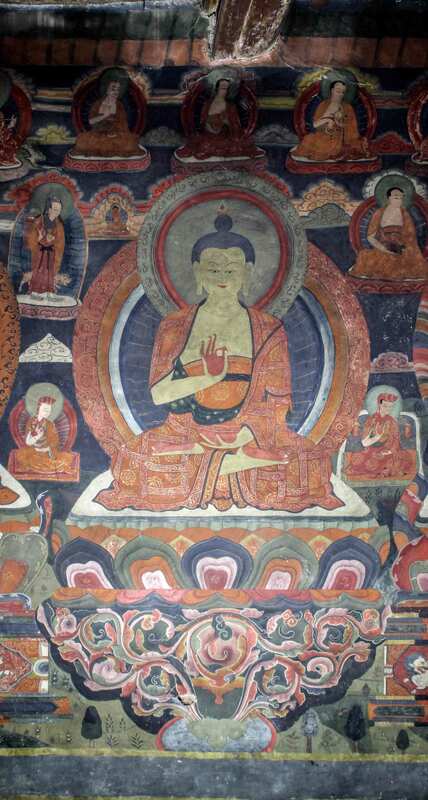 Stagsan Raspa is shown seated on the left (proper) of Jamgon Mipham Gyatso. 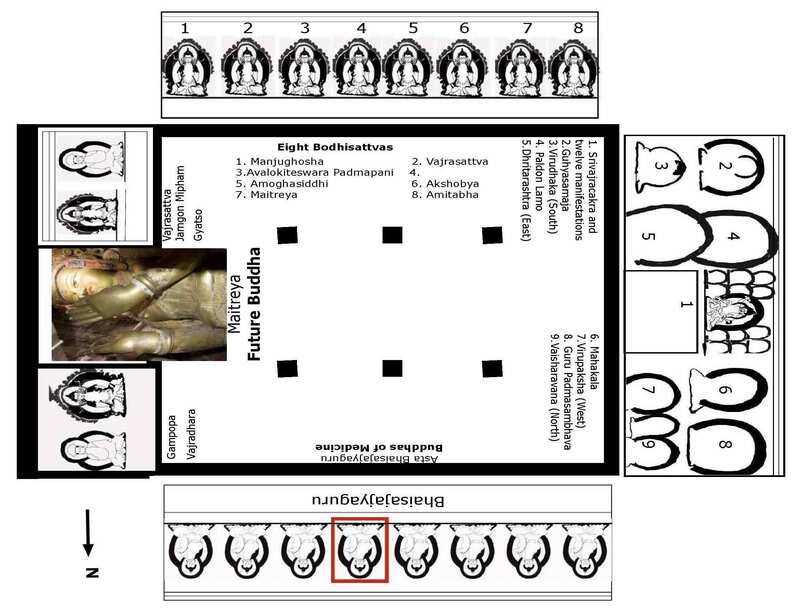 On the left (facing the wall) of the seated Maitreya, are images of Gompopa in the pravachan (teaching) mudra with a manuscript on the knees. Vajradhara is shown with arms crossed, holding a vajra and ghanta. At the centre of the throne pedestal is Vaisravana, shown seated on a snow lion, holding a parasol. He is surrounded by a foliated white cloud with several figures. The two main images have lineage gurus above them, among whom prominently identifiable are Mila ras pa, Naropa and Tilopa. South Wall (Fig. 5): On the southern wall are depictions of eight Bodhisattva figures with their lineage gurus. The first, starting from the west corner is Manjughosha in the dharmachakrapravartana mudra, holding lotus stems. The lotus flowers on either side have a flaming sword and a book. Above Manjughosha, is Shakyamuni, along with Nagesvararaja. A stupa mounted with a sun and crescent moon on the finial, and the Buddhist deity Ushanishvijaya represented on the drum is located next to Nagesvararaja. Vajrasattva is depicted on a lotus throne, seated next to Manjughosha, holding a vajra and a ghanta. Three lineage gurus are placed at the top, with Ushnishavijaya in the triangular space between the two prabha mandalas (halos). The third figure in the row is that of Avalokiteshwara Padmapani, seated on a lotus throne with hands in the dharmachakrapravartana mudra holding the stem of the lotus. At the top are figures of lineage gurus and a seated six-armed and three-headed figure. Next is a Bodhisattva in the pravachana (teaching) mudra with the other hand resting on the lap. 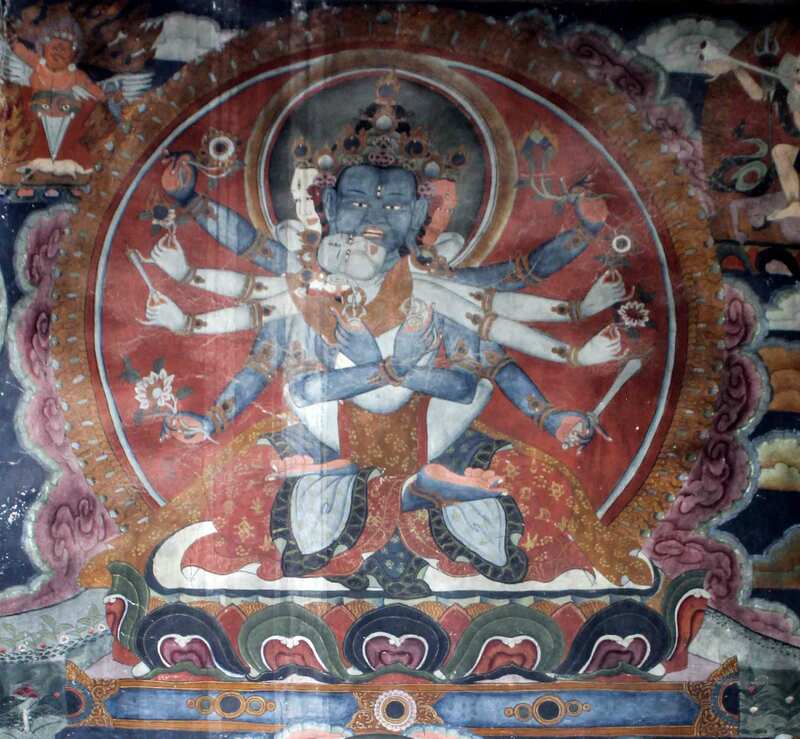 Above this is a two-armed black Mahakala and a fierce Vajrapani in small roundels, along with a four-armed seated fierce deity. The image of Vajrasattva is damaged due to water seepage, and some details are hard to read. The seated figure is depicted in the dharmachakrapravartana mudra with Bodhisattva Manjushri shown seated on a white snow lion, next to a fierce deity on the top. Amoghsiddhi, blue bodied, with one hand in the vitarka (discussion) mudra, is depicted on a lotus throne, with his other hand resting on his lap. Above this is the image of Manjushri, seated on a white lion, flanked by a seated Bodhisattva Padmapani and another figure with six arms in the lalitasana (posture of ease). In the triangular space between the halos is Yellow Kubera (Pita Jambala), with his mongoose. Alongside Amoghsiddhi, is a seated Maitreya figure, with an amphora resting on a flower. Over the figure is a depiction of a white two-armed fierce deity flanked by Dhritarashtra playing the lute and a Dakini figure. In the triangular space is a unique representation of Kubera—shown as an ascetic with blue skin, matted hair, standing with a skull cup in one hand, and a mongoose from whose mouth jewels are pouring out. At the other end is Amitayus in padmasana (lotus posture) and in the dhayana (meditation) mudra. Above him in the roundels are Goddess White Tara flanked by Avalokiteswara and Green Tara. Vaisravana, the protector deity, is shown seated on a snow lion, holding a parasol in the space over the shoulder of Amitayus. North Wall (Fig. 6): The northern wall is dedicated to Bhaisajyaguru, the Medicine Buddha, and his retinue (Chandra 2006:218-20) (Asta Bhaisajyaguru [Chandra 2006:105]). The fourth figure from the left (facing the wall), Bhaisajyaguru, is seated in the padmasana on an elaborate throne with Makara figures on both sides. The throne is encircled by cloud-like motifs. The Medicine Buddha is shown in the bhumisparsha mudra[i], touching the ground with one hand, and holding a bowl with a small plant and medicine balls in the other hand. The sun and moon discs represent the Suryavairocana and the Chandravairocana on either side of the throne. The other seven figures of the retinue have appearances similar to the Bhaisajyaguru, shown seated in padmasana on a lotus throne, wearing a saffron robe, with the usinisa (mound of wisdom on the head) mounted with a jewel. Hand gestures are repeated. The first, third, sixth and eighth figures from the left (facing the wall) have the dharmachakrapravartana mudra. The second, fourth and seventh figures have one hand in the pravachana/vitarka mudra with the other hand resting on the lap. Each figure is seated on an elaborate throne with a prabha mandala behind the body and head. All the figures are surrounded by the lineage masters and gurus, with the exception of Bhaisajyaguru, who has two Kagyu masters offering khatak (fabric). The figures of attending masters and gurus have their faces directed towards the main image of Bhaisajyaguru, and the rest that do not look at the main image are shown in a frontal pose facing the viewer straight. No image is facing away from the main Buddha. This is a unique arrangement that ties the entire composition of the Eight Medicine Buddha theme. East Wall (Fig. 7): The eastern wall has representations of fierce deities, but the geometric precision and the organisation of images on all the other walls is absent here. Over the area above the elaborately carved wooden doorway is Srivajrachakra, holding a vajra and a ghanta, with 12 manifestations arranged all around it. The manifestations are organised in two columns of three figures on either side. On the left (facing the wall) is a Ghyusamaja (Fig. 8) with a Paldon Lamo figure next to it. Under these are the protector deities Virudhaka (Fig. 9) and Dhritarashtra. On the other side is an image of Mahakala and a fierce manifestation of Guru Padmasambhava. In the lower register, we see a depiction of Virupaskhsa and Vaishravana—the protector deities. 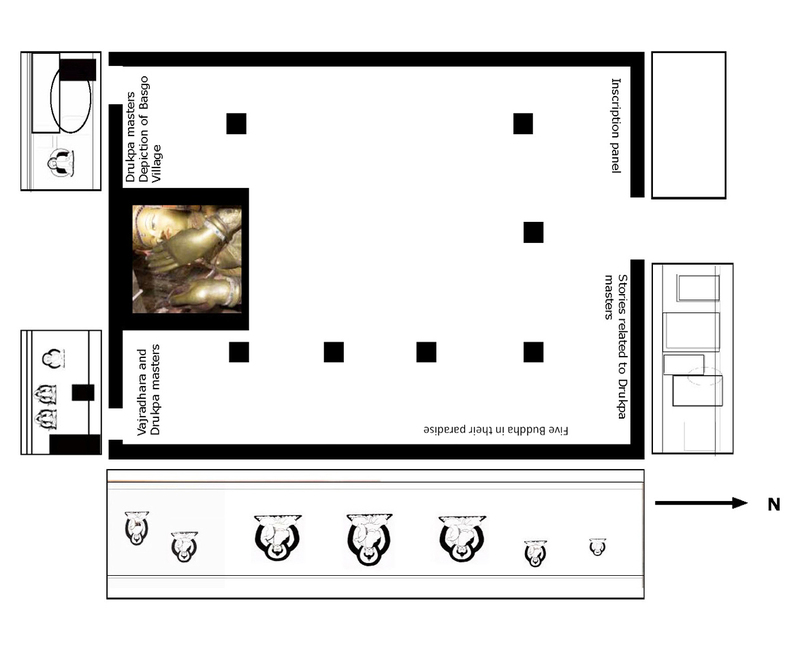 First Floor (Fig. 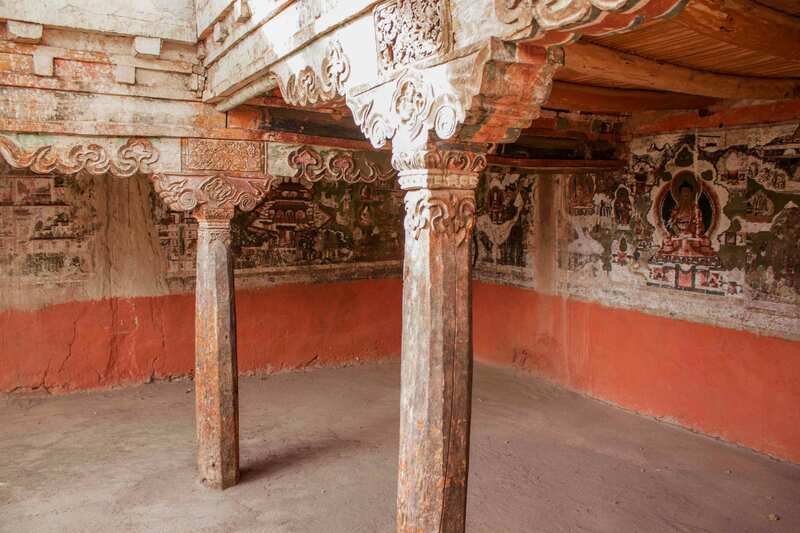 10): The first-floor courtyard has wall paintings, though the top surface of the paint layer has been washed off due to water seepage. It has left behind traces that inform of a wall painted in detail, with a large space reserved for inscription on the wall. Unfortunately, only the blank space survives today, with no trace of the inscription. This area was primarily for use by the monks. The exact function, however, is not evident. East Wall (Fig. 11): The eastern wall is divided by the entrance door. On the left (facing the wall) is the large space for the inscription, and on the right is a narrative with multiple illustrated stories from the early Life of Buddha as Siddhartha, and from the Jataka tales (previous lives of Buddha). The composition is dominated by a number of buildings depicting a palace, a monastery, and a number of secular structures. The figures are shown wearing a typical Ladakhi long coat with a sash tied around the waist; while the head is covered with a turban. North Wall (Fig. 12): This wall is dominated by the green of the landscape within which are depictions of the five Tathagatas, with attendants. The composition is peculiar as all the figures are of varying dimensions. The elements of the landscape—water bodies, mountains and trees—have been rendered in a detailed manner. The composition is populated with figures engaged in a wide range of activities—from travellers on their journeys, to people offering obeisance to the Tathagata. Along with the common people, there are a large number of minor deities around the main figures. West Wall (Fig. 13): On the western side is a wooden structure encasing the torso of Maitreya. On one side is Vajradhara, and seated next to him is Buddha Amitayus, followed by a Kagyu lineage guru. This composition is dominated by the green of the landscape. On the other side is a figure with a turban. An important section of the painting is the depiction of Basgo village and the hill. The courtyard (Fig. 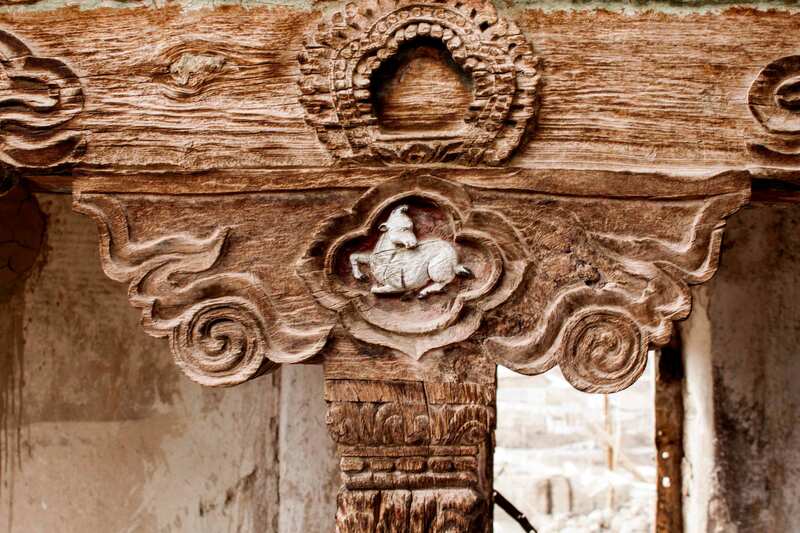 14) also has some fine examples of woodwork—particularly on top of the cloud motif in the capitol—a floral design and a quaint roundel with a deer/lamb (Fig. 15). [i] He is usually shown with his arm extended and the palm outward in the varadha (giving) gesture.